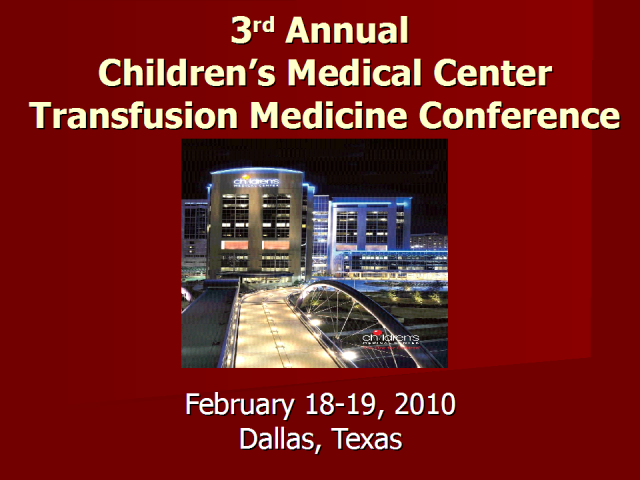 Preview of events surrounding Children's Medical Center's 3rd Annual Transfusion Medicine Conference to be held on February 18-19, 2010 at the UT Southwestern Medical Center in Dallas, Texas. This conference is designed to provide current educational material for both pediatric and non-pediatric transfusion medicine physicians, managers, supervisors and technologists. Learn from industry experts what types of testing are required for quality assurance and how automation can help to achieve your clinical laboratory testing goals. Learn from the industry experts the differences between testing and validation and why it is important. Understand how each contributes to operational quality to ensure patient safety through time-proven testing and validation principles. The R. F. Nozick Total Management Solution™ system for project management utilizes proven PMI best practices to uncover hidden risks that cause scope creep, delays, and budget overruns. The TMS methodology centers around a project master plan that creates a comprehensive matrix of all defined objectives, major deliverables, and key issues discovered through a Project Initiation Workshop (PW). This time-proven system facilitates order from chaos by effectively managing complex system implementation projects that consistently meet expectations, budgets and schedules.